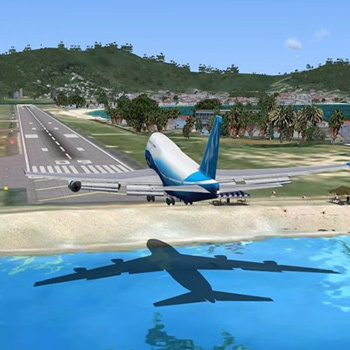 Take to the skies with one of the longest running flight franchises in Microsoft Flight Simulator X. Featuring 55 missions that range from 15 minutes to over an hour, you can wrap your hands around the controls of 20 aircraft including the Airbus 321, the Boeing 747-400, the Bell 206B helicopter, a variety of Cessna and Beechcraft models, and the Douglas DC-3. A tutorial is available for beginners, while professional pilots and expert gamers can attempt more dangerous and time-consuming flights. Missions feature such short flights as taking a floatplane from Seattle to the San Juan Islands, to longer and more challenging flights like emergency landing an airliner over water. Utilizing satellites and pictures from space shuttles, Microsoft Flight Simulator X manages to include 24 million roads, 10,000 accurately placed stars, and 24,000 airports. Improvements made to the graphics engine allow 6,000 objects per square kilometer, and vegetation and items for 23 distinct regions. For example, when flying low over Africa, you may see small huts in tribal villages and elephants grazing next to acacia trees. And by using models for human density reports, the game will render the correct amount of traffic when you are close enough to see cars on the street. Online play includes the ability to fly in a populated world, or be air traffic controller for fellow pilots.